Geographic information systems (GIS) are powerful tools for location-based strategic planning but the rationale behind site selection is often murky. Whilst ‘location, location, location’ is a well-known adage in many sectors, clearer understanding of how and why spatial decision-making can (and should) be implemented will allow a wider audience to see the strategic benefits of using spatial data. 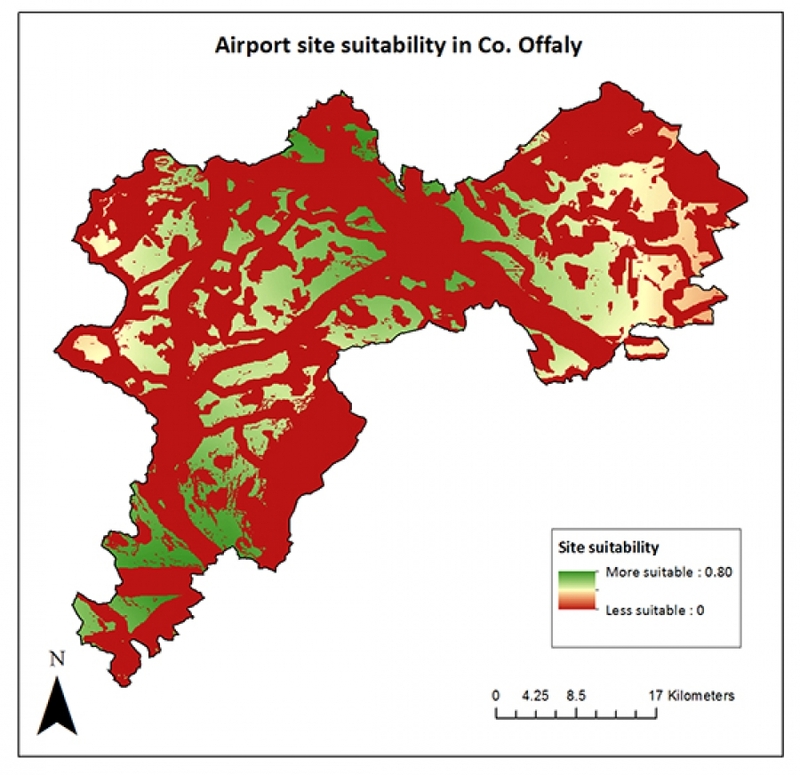 This case study gives an overview of the spatial decision-making process using the proposed development of an airport in Co. Offaly, highlighting the key transferable concepts underlying the use of GIS for planning development. Choosing where to locate something is, by definition, a spatial problem. Critically, in many cases, the ‘something’ being located may be fixed/immovable and unlikely to have the option to relocate with ease if things aren’t going well. The temptation to allow supply to dictate development is understandable and is sometimes the first step taken in strategic planning – the availability of a site (or any site) is seen as the key concern. But beginning from a spatial decision-making position provides the opportunity to outline what the limiting locational factors and desirable characteristics of the site are and how these can be targeted. These can be thought of as factors (criteria increasing/decreasing suitability within a continuous spectrum) and constraints (yes-no criteria limiting whether or not an area is suitable).For our airport example, there are operational, environmental, and land-use planning considerations that have to be accounted for. How far/close should the airport be from/to urban centres, transport infrastructure, or areas of conservation? The physical aspects of runway requirements, general aircraft take-off/landing conditions, and their corresponding environmental impact are also of concern, particularly with regards minimising the costs of construction and avoiding expensive or uncontrollable obstacles. Overall, it was decided that airport site selection would be decided by five key strategic goals with specified thresholds of suitability. Avoid impact on natural/cultural landscape, planning permission violations, and high construction costs (site should not be in protected area or peat bog). Avoid environmental conditions impacting runway safety and/or requiring significant investment to mitigate (site should not be on high slope (>2.5°) or in an area with high wind speed (>7m/s)). Target connection with existing infrastructure/transport network to increase accessibility. Airport site must comply with safety requirements by not siting too close to existing networks (site should be near primary/secondary roads and railway, but not within 1km). Target connection with existing population centres (employment, customer base). Important not to negatively impact urban environment (site should be near urban centre but not within 2.5km). Avoid disrupting lacustrine/fluvial habitats sensitive to large-scale construction (site should not be near lakes or rivers). These factors may vary for other types of developments – retail outlets might be interested in the proximity of competitors, schools might be concerned with the age profile/demographics of their catchment area – but the definition of spatial characteristics of interest should be one of the first steps in development-planning. 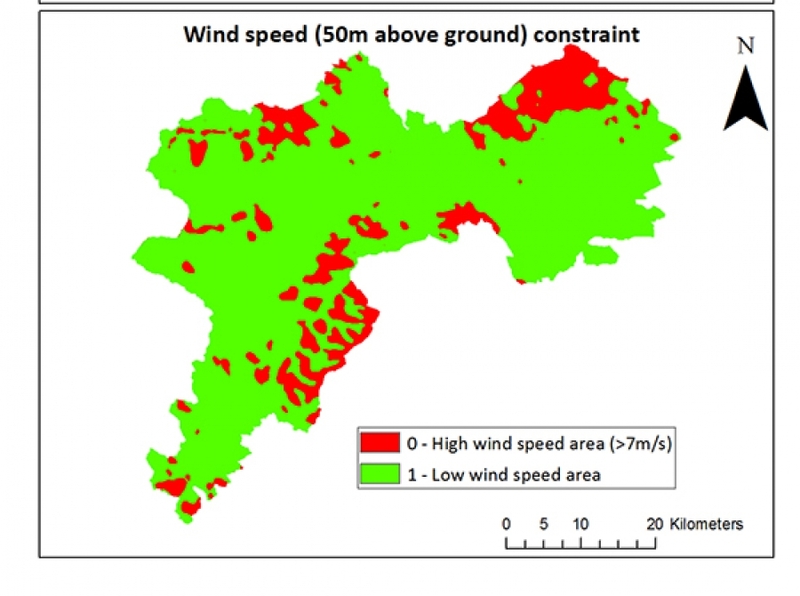 In practice, this identification of key criteria must also take into account the range of spatial information which is relevant and, crucially, available. Decision-making often involves the integration of a wide range of spatial information from different sources and sometimes in different formats e.g. 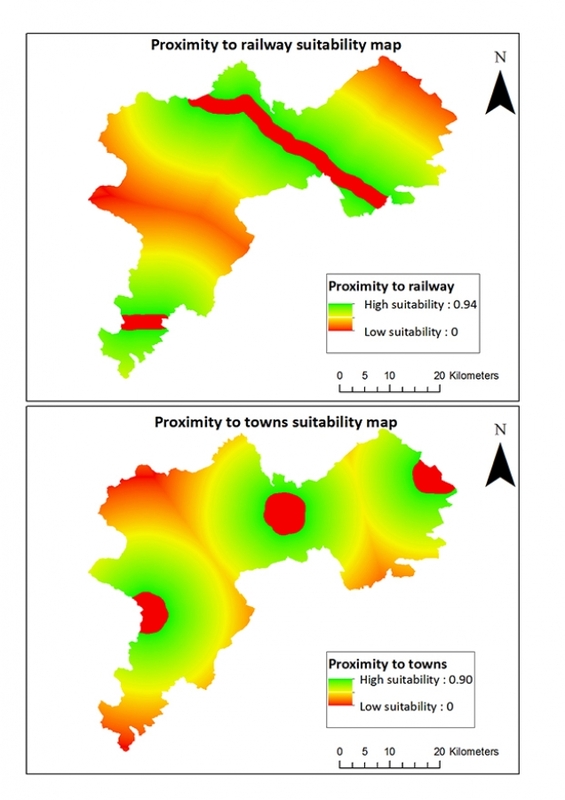 road/railway networks, CORINE land-use maps, digital terrain models (DTMs) of elevation/topography, Census data. 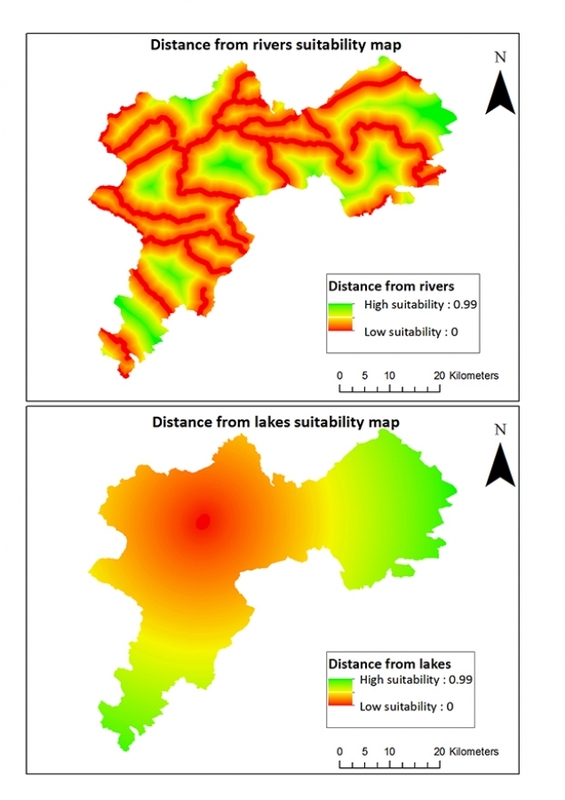 Working with different types of data in various formats can be challenging and requires careful pre-planning to integrate spatial information but the actual production of individual criteria maps using GIS is relatively straightforward in most currently available platforms. Airport site selection was undertaken using a 90 metre resolution DTM, CORINE2006 land cover data, National Parks and Wildlife Services (NPWS) maps of areas legally protected from development, transport network maps (road and railway), lake/river data, urban area locations, and wind speed data. Individual criterion maps are useful but the real power of GIS is the combination of multiple criteria to reach holistic location conclusions. A prerequisite to doing so is the normalisation of map layer values to allow for meaningful comparison across different scales. This is achieved via mathematical transformation of each criterion so that the minimum and maximum suitability values range from 0 to 1 in an abstract scale of suitability, rather than the proximity/distance values calculated in spatial scales (e.g. metres). Combining spatial criteria draws upon the underlying principles of multi-criteria evaluation (MCE), particularly with regards the recognition that criteria are not necessarily of uniform importance for decision-making purposes. MCE commonly calls for the allocation of weights to criteria to reflect varying relative importance but weight allocation can be a contentious procedure. Successful combination of criteria requires careful consideration of purpose, as well as the nature of the criteria and the data upon which they are founded. Weight allocation is central to defining the decision maker’s preferences and, if conducted inappropriately, can compromise the integrity of the MCE process. Deciding on how to allocate weights can be a qualitative and/or quantitative endeavour and there is no one universal correct approach. Public and private consultation should also be engaged with transparently to encourage a diversity of opinions as no single stakeholder can be expected to produce the perfect model – the CEO of the airport’s development firm may feel differently about weighting proximity to urban centres than a local resident might, after all. 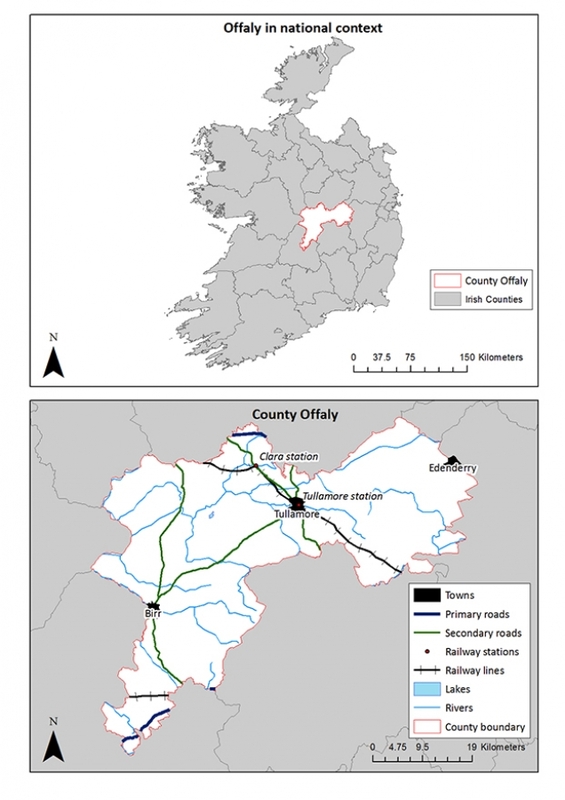 In the Co. Offaly airport example, criteria weights were calculated using pairwise comparison and a mathematical procedure known as the ‘analytical hierarchy process’ but the main goal built into these weightings was integration with the existing transport network. Close connection with transport infrastructure was seen as the crucial factor in this example, given the natureof the airport as a transport node, but this goal might be less appropriate forother applications e.g. site selection for a public park or a nuclear wastestorage facility. Once weights have been calculated,individual criteria layers can be multiplied in a GIS by their weighted valueand combined to produce an overall picture of site suitability. Areas of highsuitability can then be targeted as preferential for site selection purposes. Producing a site suitability map should be one of the first steps in strategic location planning but it should be seen as a continuous and iterative process, rather than a definitive and singular solution. 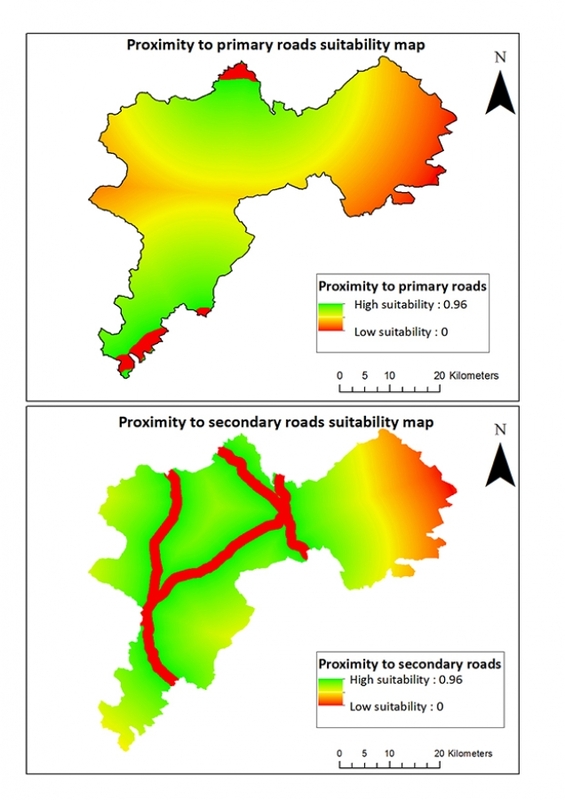 Suitability, the criteria of interest, and their relative weightings can be returned to and re-evaluated as many times as is necessary, using GIS as a central decision-making support throughout the development project. Beginning from a spatial problem-solving perspective with a clear sense of the priorities/limiting locational factors of interest can be useful in identifying where attention for development should be focused (and where it shouldn’t). 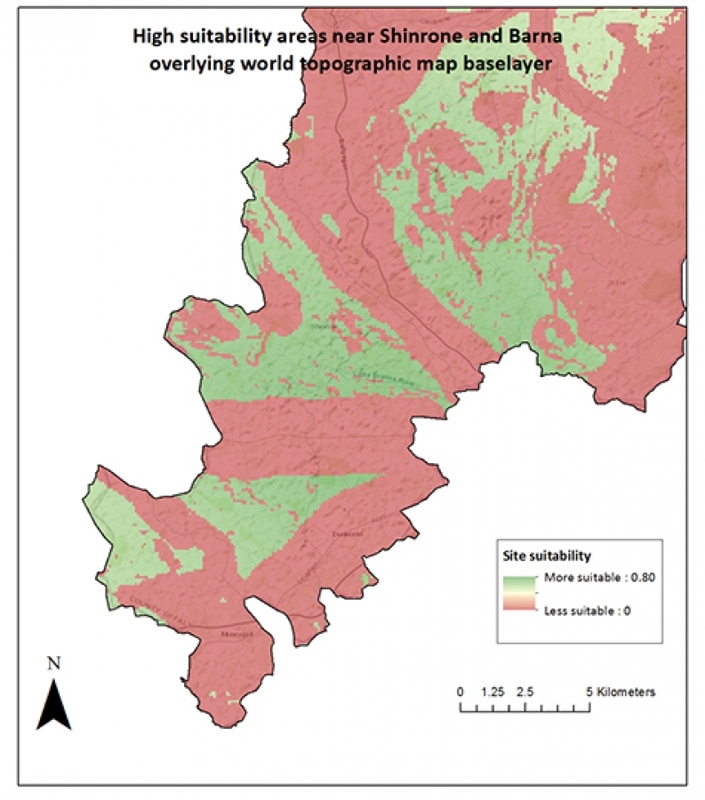 Overall, collaboration between GIS specialists and their clients must be founded on a mutual understanding of the benefits of applying spatial information for strategic planning and how this relates to the customer’s priorities. GIS should not be seen as a ‘divining rod’ but applying a spatial perspective to business proposals can address many of the pitfalls and promises of development. Gráinne a graduate of the M.Sc. in GIS and Remote Sensing at Maynooth University has been working for Mallon Technology in the Department of Agriculture, Food, and the Marine. Gráinne is very interested in the interaction between society and space and hopes to use GIS to research how the geographies of the twenty-first century world are changing, particularly with the expansion of digital technologies.